One can never get away from the flavors one grows up with. I was raised in the east Bronx, and while our household was an Ugrian-semitic island of Hungarian food mixed with matzoh ball soup and chopped liver, the east Bronx was - and is - one of New York City's strongest Italian neighborhoods, alongside a healthy dollop of Irish and Plattsdeutsch speaking Germans. But in my nabe off of East Tremont Avenue, we ate Italian food. The neighbors were all Italians from Calabria and Abruzzi, my Dad's best buddy (and NYPD patrol car partner) was Sicilian, and I was essentially raised on Italian American home cooking, a style my immigrant Hungarian mother came to know as "American" cooking since she learned it from the neighboring wives in a place called "America." Even today, the east Bronx is full of Italian bakeries and butcher shops and some of the best pizza to be found in the entire city. It was there that I defined my taste in sausages: Italian sausages, southern style, flavored simply with fennel and hot peppers. My Mom sometimes took us shopping in Yorkville, Manhatten's old Hungarian neighborhood which used to be lined with Hungarian cafes, restaurants, and grocery shops. It was the place where we could stock up on paprika and buy Hungarian debreceni kolbász and hurka (liver or blood sausages) and "real" bread. Yorkville's Hungarians have pretty much disappeared these days, except for the Hungarian church and a couple of newer Hungarian restaurants, mostly pushed out by rising rents and the lure of the "Hungarian" suburbs like New Brunswick, NJ and Bridgeport, Conn. But when I visited Hungary and finally moved here I was a sausage demon. In Hungary, you won't often find sausage on any menu - you eat it at home or standing up in a butcher shop. And it used to be, in my opinion, a lot better. Today, most kolbász seems to be an industrially produced cheap meat tube with a rubbery consistency and an over salted spicing of low grade paprika. Sausages made for grilling - the ones that are "raw" and not intended for a long refrigerator life - tend to be so stuffed with paprika that they end up dry with an almost almost sandy consistency. After a decade or so, I grew strangely tired of the Hungarian grilled kolbász. And so... I learned to make my own. The sausages of my youth. Italian sausages. It really isn’t that hard, although I would need a full meat grinder to do it right. I have one, an old crank handle model I picked up at a junk market, but the blades are wrong, although it does a decent job of churning out the sausages with already ground meat. But for smaller amounts I just use a plastic sausage nozzle attachment and push the kolbász through with my thumb. It leaves air bubbles in the sausages, but since I am not going to smoke or store these babies, I can simply prick the skin with a toothpick and carry on without worry of food poisoning. . Most butchers here sell kolbász bél, cleaned intestines for stuffing kolbász, so after rinsing a meter long section by running water through it in my sink, I mix up the meat and spices. To get the right mix of meatiness and juiciness, I take two thirds measure of somewhat fatty ground pork, and add to it a third measure of hand chopped pork belly meat. This is a fatty bacon cut called "nyérs csaszár" sold cheaply for home bacon hobbyists and emigre chinese home cooks, who seems to be the main customers for pork belly at the Bosznyak ter market where we shop. The spices are insane amounts of black pepper, fennel seeds, and nutmeg, with some chopped parsley for good measure. In the summer I might add chopped fresh basil from the “garden” as well. Half of the batch gets a palmful of crushed dried hot pepper flakes, the other goes without. Fried or grilled, these are a pretty close approximation of a New York Italian sausage. I’ve also experimented with other combinations including fresh Portuguese chourizo sausage (hot paprika and garlic) and German bratwurst (nutmeg, black pepper, and coriander.) Under normal conditions I would eat this with a hunk of crusty bread or a plate of pasta, but since I am under a self imposed regimen forbidding those wonderful things it usually gets served with a salad or my old friend , Mr. Zucchini. I’m gonna hate Mr. Zucchini pretty soon. Fumie is not a stranger to the odd hunger pangs of home, in her case, Tokyo. You might think that recreatring Japanese local specialties would be harder to satisfy than simple Calabrian food, but she does pretty well, what with cans of smoked eel and seaweed sent to her from home and local Chinese groceries and the occasional trip to Vienna. But Edokko people (people really native to Tokyo) like Fumie are crazy for natto. Natto is rotten soybeans, fermented by a special bacteria until they turn sour and emit a gummy stringy slime that Edokko love. Most other Japanese won’t eat natto, and it is one of those foods that foreign food writers always highlight as examples of weird cuisine in Japan, after fried bees and poisonous fugu sashimi. This is the dish that brought Anthony Bourdain to his knees, and he described it as "an unbelievably foul, rank, slimy, glutinous, and stringy goop of fermented soybeans... Given a choice between eating natto and digging up my old dog Pucci (dead thirty-five years) and making rillettes out of him? Sorry, Pucci." Fumie makes natto at home, on top of the living room heater, in fact. It is not that bad, actually. Stirred into a stringy mush with hot mustard and soy sauce, eaten on rice for breakfast? Maybe natto takes some getting used to, but I’d say it is a big improvement on Pucci. You can buy natto in Japanese grocery shops in small styrofoam cntainers, but the closest to us is in Vienna, and thus we have been forced to produce natto ourselves. And we only produce enough for ourselves. 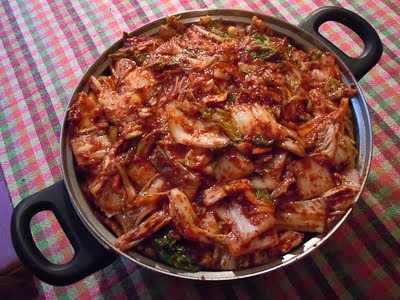 So don't even ask... On the other hand, Fumie has to have kimchi, the Korean pickled cabbage that has become to Japanese cuisine what Pizza is to New York cuisine. To make decent kimchi, you need napa cabbages (which are easy to get here - although I wonder what, exactly, Hungarians do with them) and red pepper paste - which we can get at the chinese grocery. And also fish sauce, various spices, and glutinous rice flour, all of which we keep stocked in our pantry. The amount you see here lasted about a month, only long enough for it to ferment and get really tangy. Kimchi is something you make in the winter months - while you can store a few pots of it outside on the terrace where it can ferment into stinky perfection. With March coming up... guess we will have to make another batch real soon.